Based on a popular comic book (from Kodansha) and created by BONES studio. In Japan, it is said that there are over 8 million gods. 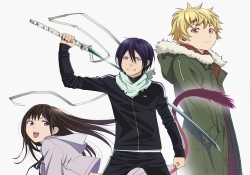 One of them, "Yato" is ranked in the low ends of the gods meets a 14years old ghost, Yukine who becomes his assistant and weapon and Hiori, a human high school girl. Their goal is completing requests from humans in order to raise their ranking along with battling Bishamon, an evil god who is trying to take over the world. A thrilling action fantasy TV animation series.